A black Llama led the Maricopa County Sheriff’s department on a high speed chase through the retirement community of Sun City, Arizona yesterday. 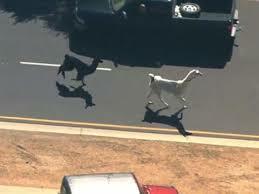 The llama is suspected in the murder and robbery of a gas station clerk in the early morning hours of February 28th. Police arrived after receiving a 911 call to find the clerk lying on the floor behind the counter. Just before he died of a gunshot wound to the chest he told police, “He was black.” Two llamas were seen running from the scene, one black and one white. It wasn’t long before the suspect stole a car and led police on a high speed chase. A quick thinking bystander snapped this photo just before the suspect ran him down with the stolen car as police were in hot pursuit. “We forced the car off the road, and it was a nice one too. A Bentley, I think,” an officer said. The suspect was arrested after the car crashed into a cactus. The suspect had a white accomplice with him and police say they can’t understand why. “Maybe he was forced into helping by the black one,” the sheriff said. “Anyway, we’ve got him now and we’ll get the truth out of him. 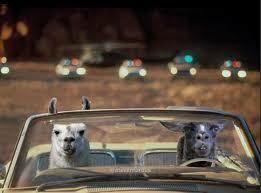 We have our ways.” The Llamas are being held in the Maricopa County jail, awaiting charges. This entry was posted in Satire and tagged Llama, Llamas, satire by marshallbutcharmstrong. Bookmark the permalink. I don’t see why they have to lock up the white one.